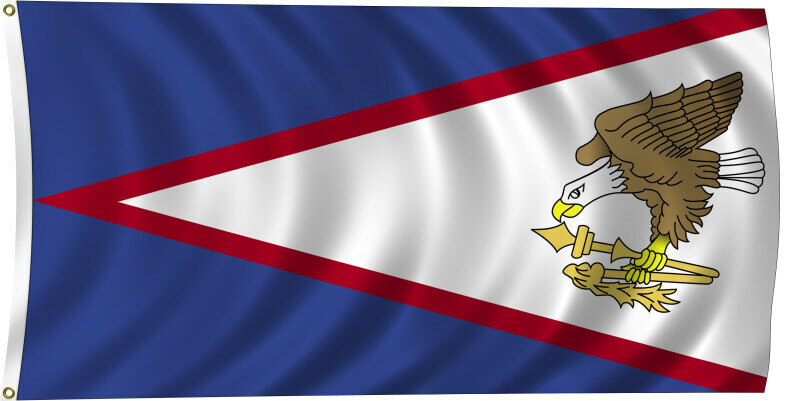 Color flag of American Samoa. Blue, with a white triangle edged in red that is based on the fly side and extends to the hoist side; a brown and white American bald eagle flying toward the hoist side is carrying two traditional Samoan symbols of authority, a war club known as a "Fa'alaufa'i" (upper; left talon), and a coconut fiber fly whisk known as a "Fue" (lower; right talon); the combination of symbols broadly mimics that seen on the US Great Seal and reflects the relationship between the United States and American Samoa. Flat color and black/white versions of world flags are available on the Clipart ETC website.